Silicon Valley chiefs clash with President Trump on much including climate change, but most are sticking around to advise him. Some may have a practical reason: the big plan to upgrade government IT. Amazon and others will be challenging dominant contractors such as IBM and HPE. U.S. President Donald Trump and Satya Nadella, CEO of Microsoft Corporation listen as Jeff Bezos, CEO of Amazon speaks during an American Technology Council roundtable at the White House in Washington, U.S., June 19, 2017. The Information Technology Industry Council, which represents Amazon, Apple, Google and other online companies, said on Aug. 2 that it rejects a U.S. Senate proposal to curb immigration to the United States by half over a decade. President Donald Trump praised the plan, which would transition U.S. immigration to a merit-based system from the current program based on family ties. “This is not the right proposal to fix our immigration system because it does not address the challenges tech companies face, injects more bureaucratic dysfunction, and removes employers as the best judge of the employee merits they need to succeed and grow the U.S. economy,” the council said in a statement. Separately, Trump has proposed a $95 billion budget for information technology for the 2018 fiscal year, a 16 percent increase in spending from the last year of Barack Obama's term in office. Trump issued an executive order in May creating the American Technology Council, which is made up of government officials charged with overhauling technology. The effort is led by Trump's son-in-law, Jared Kushner, who is a senior adviser and also heads the Office of American Innovation. 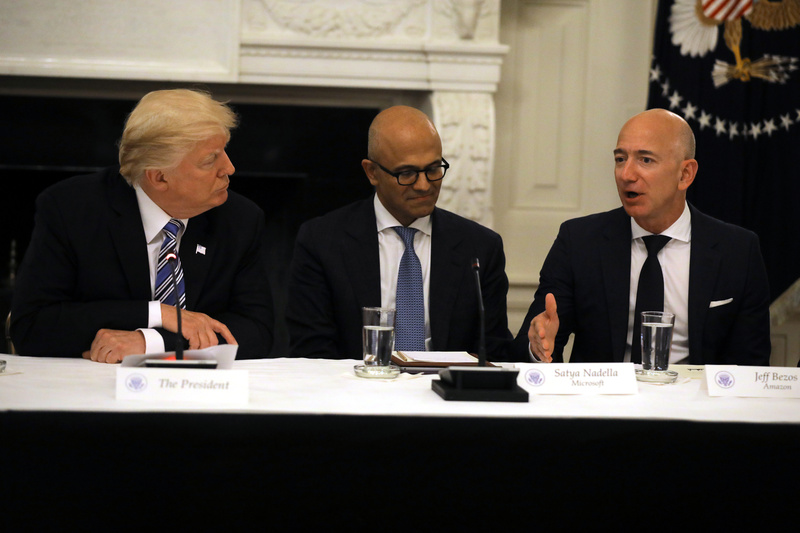 Apple Chief Executive Tim Cook, Amazon CEO Jeff Bezos, Oracle CEO Safra Catz and Microsoft CEO Satya Nadella were among the tech leaders who attended a White House meeting on June 19, where Trump asked for their advice on modernizing government IT. Bezos told Trump that the government should use commercial technology whenever possible. A separate group of CEOs has presented Trump with a plan on how the government could save $1 trillion by updating its technology. For example, spending more on big data and analytics could save the government $205 billion, according to their report. Trump cited some of the research at the gathering of technology chieftains.